"House, Senate accuse each other of inaction on critical legislation" was first published by The Texas Tribune, a nonprofit, nonpartisan media organization that informs Texans — and engages with them — about public policy, politics, government and statewide issues. With the clock ticking on the legislative session, the House and Senate on Sunday lobbed accusations back and forth over inaction on critical legislation needed to save some state agencies from shuttering and to avoid legislative overtime. It started with in the House, where members of the Sunset Advisory Commission, which is responsible for periodic reviews of state agencies, accused the Senate of playing games with Texans’ health and safety by holding out on legislation that would keep state agencies, including the Texas Medical Board, in existence. Shortly after that, in a news conference of their own, members of the Senate said that the House had created problems that can only be fixed in a special session of the Legislature. The standoff on the sunset legislation is the latest skirmish between the two chambers with just a day and half left in the legislative session. The measure is key to keeping state agencies open, but Patrick has threatened to hold it hostage to force a special session if the Legislature does not act on a “bathroom bill” to regulate bathroom use for transgender Texans and property tax to require voter approval when local tax collections increase 5 percent. The House has acted on narrower versions of those measures, and House Speaker Joe Straus has made clear his chamber won’t go any further. The Senate adjourned after midnight Sunday without accepting the House version of either piece of legislation. Sunday marked the second set of dueling press conferences between the legislative chambers in three days. On Friday, long-simmering tensions between Patrick and Straus boiled over tense remarks from each presiding officer that revealed they were at an impasse over the bathroom regulations. On Sunday, House members of the Sunset Commission pointed to the Senate’s decision to strip a key amendment from Senate Bill 1929 that would have saved some state agencies from closing their doors. The amendment, added by the House in a last-ditch effort to save those state agencies and avoid the need for a special session, was necessary because the House failed to pass a standalone bill to extend those agencies' lives. But the Senate removed the language added by the House without offering any reasoning to the conference committee that was appointed to iron out a final bill, said state Rep. Cindy Burkett, the House's lead negotiator on the bill. At Sunday's Senate news conference, Sen. Van Taylor said the House “created the crisis you see in front of you today,” and argued that while the House’s proposed fix on the pending sunset legislation would continue five agencies at risk of closing, it would not extend chapters of state code, Taylor said. Back in the House, Gonzales passed out printed copies of the House amendment and underlined language that would nullify Taylor’s claims about the government code. Only the governor can call a special session, and his office has insisted that lawmakers resolve their issues during what’s left of the regular legislative session. But he could be forced to call lawmakers back to avoid the closure of those agencies. Without action by the Legislature, the agencies without regulations — such as the Texas Medical Board — would enter a one-year “wind-down” period after Sept. 1, 2017, in which they would begin the process of shutting down completely. This would leave the the state without an agency whose job it is to police doctors who practice in the state. The predicament is reminiscent of 2009, when both chambers failed to pass another “sunset safety bill” to keep state agencies like the Texas Department of Transportation and the Racing Commission from shutting down. A special session followed. House, Senate accuse each other of inaction on critical legislation By Alexa Ura May 28, 2017 Editor's note: This story has been updated throughout. With the clock ticking on the legislative session, the House and Senate on Sunday lobbed accusations back and forth over inaction on critical legislation needed to save some state agencies from shuttering and to avoid legislative overtime. It started with in the House, where members of the Sunset Advisory Commission, which is responsible for periodic reviews of state agencies, accused the Senate of playing games with Texans’ health and safety by holding out on legislation that would keep state agencies, including the Texas Medical Board, in existence. “The House has done its job on all matters sunset-related,” state Rep. Larry Gonzales, R-Round Rock, said in a news conference Sunday. He is House chairman of the Sunset Advisory Commission, which is responsible for periodic reviews of state agencies. 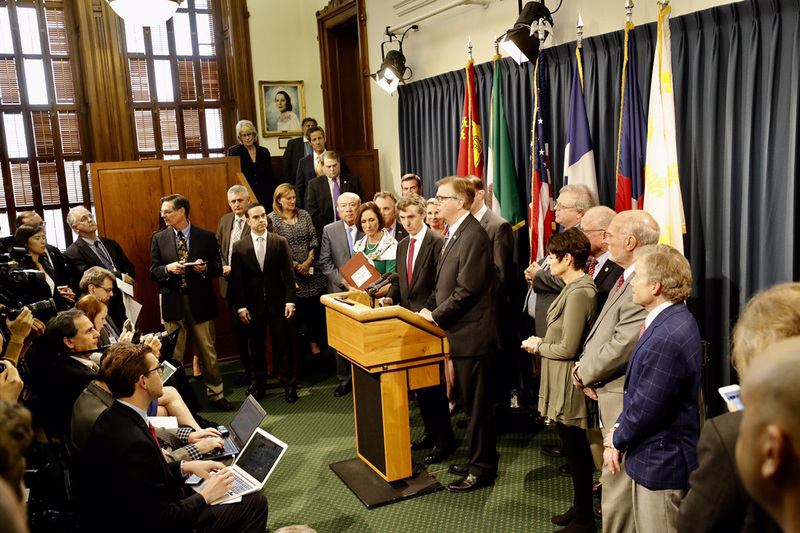 “It’s the purposeful inaction by the Texas Senate which puts us where we are today.” Shortly after that, in a news conference of their own, members of the Senate said that the House had created problems that can only be fixed in a special session of the Legislature. “The gap between what the real truth is and what was said is about as wide as the Grand Canyon," said Lt. Gov. Dan Patrick, who presides over the Senate. Later, he added, “The House under the speaker’s leadership has been slow. Whether it was just not managing the calendar or whether it was purposefully done to kill legislation, I’m not sure.” The standoff on the sunset legislation is the latest skirmish between the two chambers with just a day and half left in the legislative session. The measure is key to keeping state agencies open, but Patrick has threatened to hold it hostage to force a special session if the Legislature does not act on a “bathroom bill” to regulate bathroom use for transgender Texans and property tax to require voter approval when local tax collections increase 5 percent. The House has acted on narrower versions of those measures, and House Speaker Joe Straus has made clear his chamber won’t go any further. The Senate adjourned after midnight Sunday without accepting the House version of either piece of legislation. Sunday marked the second set of dueling press conferences between the legislative chambers in three days. On Friday, long-simmering tensions between Patrick and Straus boiled over tense remarks from each presiding officer that revealed they were at an impasse over the bathroom regulations. On Sunday, House members of the Sunset Commission pointed to the Senate’s decision to strip a key amendment from Senate Bill 1929 that would have saved some state agencies from closing their doors. The amendment, added by the House in a last-ditch effort to save those state agencies and avoid the need for a special session, was necessary because the House failed to pass a standalone bill to extend those agencies' lives. But the Senate removed the language added by the House without offering any reasoning to the conference committee that was appointed to iron out a final bill, said state Rep. Cindy Burkett, the House's lead negotiator on the bill. “It’s on them. The ball is in their court,” an incensed Gonzales said while flanked by members of the Sunset commission. “They stripped out our language. They can fix this today by concurring with SB 1929.” At Sunday's Senate news conference, Sen. Van Taylor said the House “created the crisis you see in front of you today,” and argued that while the House’s proposed fix on the pending sunset legislation would continue five agencies at risk of closing, it would not extend chapters of state code, Taylor said. “The fix the House sent us doesn’t work,” he added.“The only way to fix this is with a special session.” Back in the House, Gonzales passed out printed copies of the House amendment and underlined language that would nullify Taylor’s claims about the government code. Only the governor can call a special session, and his office has insisted that lawmakers resolve their issues during what’s left of the regular legislative session. But he could be forced to call lawmakers back to avoid the closure of those agencies. “Essentially, they’ve got to come back if they don’t pass something by tomorrow,” Joey Longley, the former director of the Texas Sunset Commission, told The Texas Tribune late Sunday night. “They’ve got to take care of the Texas Medical Board and those other health professions whose boards are also going away.” Without action by the Legislature, the agencies without regulations — such as the Texas Medical Board — would enter a one-year “wind-down” period after Sept. 1, 2017, in which they would begin the process of shutting down completely. This would leave the the state without an agency whose job it is to police doctors who practice in the state. “Anybody, anywhere could call themselves a doctor, and who is going to challenge that?" Longley said. "There’d be no statute that says you have to do anything to be a doctor.” The predicament is reminiscent of 2009, when both chambers failed to pass another “sunset safety bill” to keep state agencies like the Texas Department of Transportation and the Racing Commission from shutting down. A special session followed. Surrounded by senators, Lt. Gov. Dan Patrick talks to reporters on May 29, 2017. Bob Daemmrich for The Texas Tribune Alex Samuels contributed to this report. "House, Senate accuse each other of inaction on critical legislation" was first published at by The Texas Tribune, a nonprofit, nonpartisan media organization that informs Texans — and engages with them — about public policy, politics, government and statewide issues. Link back to the original article, which is located at https://www.texastribune.org/2017/05/28/sunset-press-conference/.